Petite Sally was acquired by my niece-in-law at an estate sale. 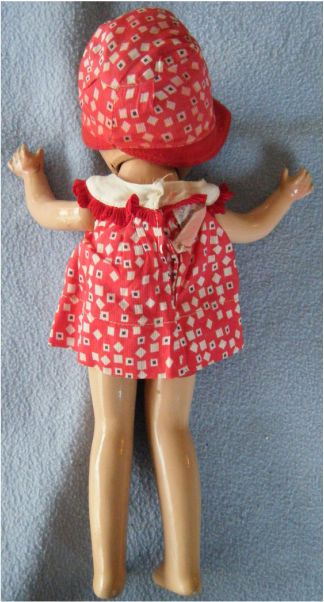 Petite Sally is an American Character doll and is wearing her original clothes. She is from the 1930's and is what is known as a "compo" or composition doll. Composition dolls are made from compressed sawdust and glue or similar materials and then painted. They predate vinyl, hard plastic, and even celluloid dolls. They were easier and cheaper to mass produce compared to the more breakable porcelain/bisque dolls. Their age and structure make them relatively fragile. 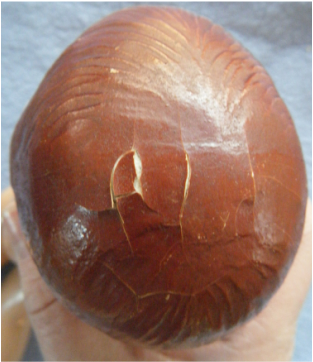 They often exhibit cracks or "crazing" from shrinkage over time. Too much moisture is also a threat to these dolls. Normally, my sister and I do not work on dolls from this time period, but our niece asked us to look into restringing the doll because the elastic cord inside had lost its "elasticity" over time and the head and limbs droop so much that the doll cannot be posed for display. 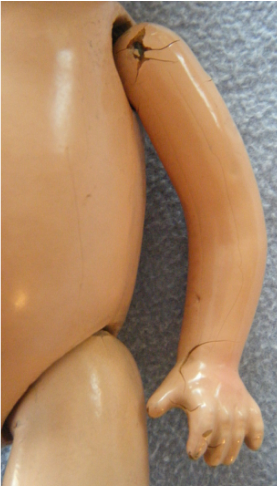 After inspecting and photographing the condition of the doll we decided that it was too risky to attempt to restring the doll given our lack of expertise in working with compo and the number of cracks in the doll. Sometime the best way to preserve a doll is to do nothing. The elegant simplicity of this doll gives her a great deal of charm. She does not have any of the exaggerated facial features of modern dolls. Even though she does not have stranded hair, it still looks soft and natural. 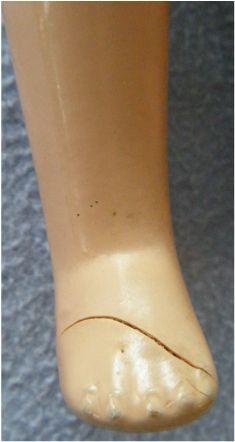 The glossy finish and rouging of the cheeks and knees gives the doll a life-like feel. 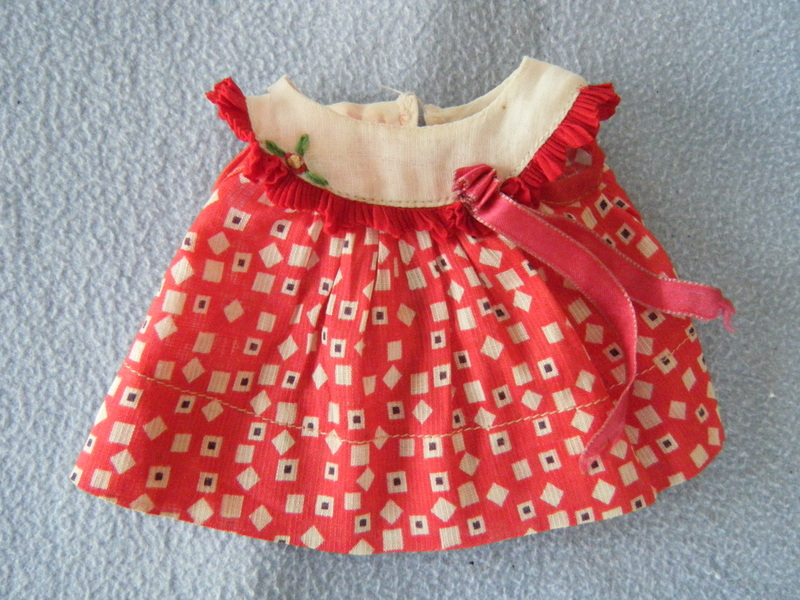 The dress is well made and has interesting details - like the frill, ribbon, and flower. Once the clothing has been removed, the delicate condition of the doll becomes apparent. The foot is also cracked. The toes are more hinted at than actually sculpted. Composition dolls generally do not have a great deal of detail in the fingers and toes because they would be too easy to snap off. Her dress tag includes her picture and her name. Notice the wool felt brim on her bonnet. The crumbling shoulder might not withstand the stresses associated with restringing. Notice the crack in the wrist region. The pudgy, not fully separated fingers, are typical of compos. The top of the head has "crazing". Crazing is the result of temperature and humidity affecting the "composition" recipe underneath a painted surface. SALLY A PETITE DOLL is embossed on her back. American Character doll company was founded in 1919. In1923 they started to use "Petite" as a name for their line of dolls. 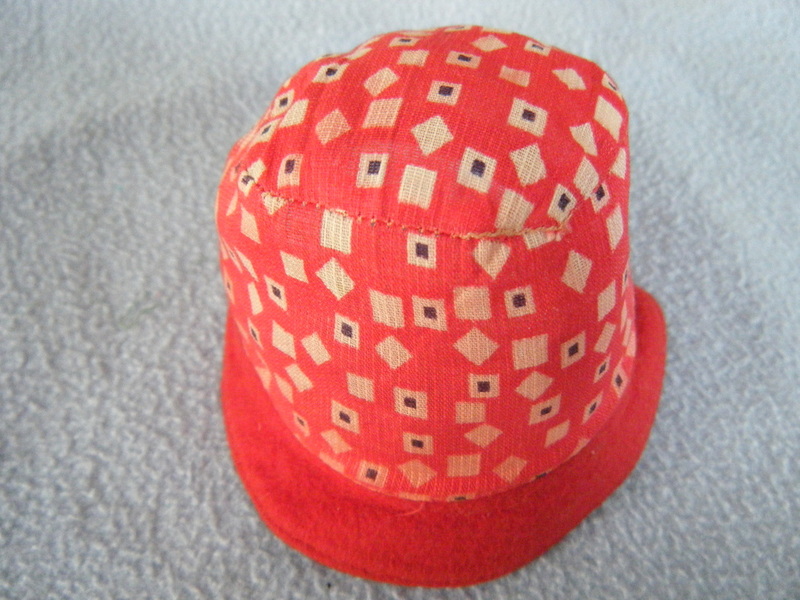 Although their dolls were considered high-quality, many of their designs imitated the Effanbee line that was particularly popular at the time. Petite Sally was a look-alike for Effanbee's extremely popular Patsy doll and was introduced in the early 1930s. One distinguishing factor of the American Character dolls were their clothes and the dolls were considered "well-dressed". 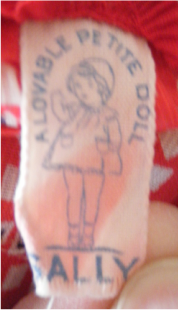 Even the tags on the clothes were considered clever and are quite cute! 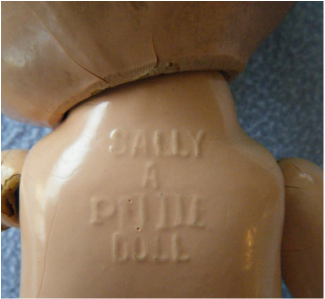 Some of the Sally dolls had cloth bodies, but many had an entirely composition body with jointed head, arms and legs. While most of them had molded painted brown hair, some of them had human hair wigs. They had painted brown side-glancing eyes and a painted, closed mouth. They appear to have come in 12", 14", 16" and 19" models. In 1934 American Character produced and advertised Sally as a "movie star doll" and put a blonde wig on her that closely resembled Shirley Temple's hair and dressed her in a polka-dotted dress that is very similar to the one universally recognized as a Shirley Temple dress!! Their ads that year for Christmas said "Sally's in the Movies". There is a rather rare version of the doll that has very unique hairstyle that includes a braid across the top of her head and she was marketed in both the 14" and the 16" size as the Carol Ann Beery doll. Carol Ann Beery was the daughter of actor Wallace Beery and as a small girl had some minor rolls in various movies. In 1932 a very special version of the 19" Sally doll was used to commemorate the 200th birthday of George Washington. 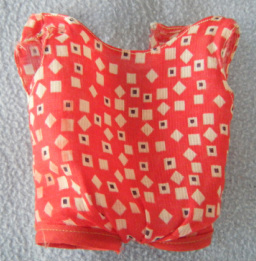 This doll is fully jointed composition except for the arms, which were made of rubber. A white mohair wig was designed to fit over the molded hair and the doll was produced with gray tin sleep eyes and the closed mouth. The clothes were quite special and include a tag with a profile of George Washington's head in a circle surrounded by the words "George Washington Bi-Centennial" and the dates 1732-1932 underneath it. This doll is extremely rare and commands a hefty price when offered at auction.